The Notre Dame Fighting Irish return to Southern California to take part in the Pacific Coast Shootout for the second time in three seasons. 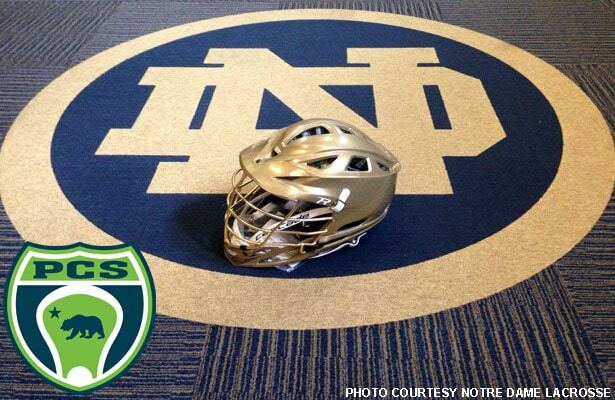 The Irish played Denver in the inaugural event in 2014 and will take on Maryland this year. Tickets for the March 5 event at Orange Coast College are available here. As the 2016 season approaches, here are a few things to know about the Notre Dame program and this season’s squad. Preseason pick: Notre Dame was ranked No. 1 in the Inside Lacrosse preseason Top 20, the first time the Irish have entered the season in the top spot. Last year, Notre Dame was No. 2 in the preseason. The Irish have entered the season ranked in the Top 10 in each of the last six seasons. ACC in Indiana: Though Notre Dame is located in South Bend, Ind., the Irish are entering their third season as a member of the Atlantic Coast Conference after four years as members of the Big East. In the ACC, Notre Dame competes with Duke, North Carolina, Syracuse and Virginia. The Irish won the ACC tournament title in 2014, their first year in the conference, and claimed the ACC regular-season title last year. Plenty of experience: Notre Dame returns seven starters from its 2015 national semifinal team and 34 total student-athletes who earned playing time. All-American x 3: Three first-team All-Americans are back from the 2015 season for the Irish, one at each of the three main position groups. Senior attack Matt Kavanagh, junior midfielder Sergio Perkovic and senior defenseman Matt Landis lead a veteran roster. Last season marked the first time the Irish have had three first-team picks. Steady hand: Notre Dame coach Kevin Corrigan is entering his 28th season at the helm of the Irish lacrosse program, the second longest tenure among active Division I men’s lacrosse head coaches (behind only Bob Shillinglaw at Delaware). Corrigan has posted a 265-123 record (.683 winning percentage) over that span, leading the Irish to the NCAA Final Four five times (four in the last six seasons). For more information on the Pacific Coast Shootout and to buy tickets click on the image below.